We’ve had the pleasure of arranging Botleys Mansion wedding flowers many times, the latest ones can be seen on our Botleys Mansion venue page. But this weekend we were thrilled to arrange flowers for a more unusual wedding. 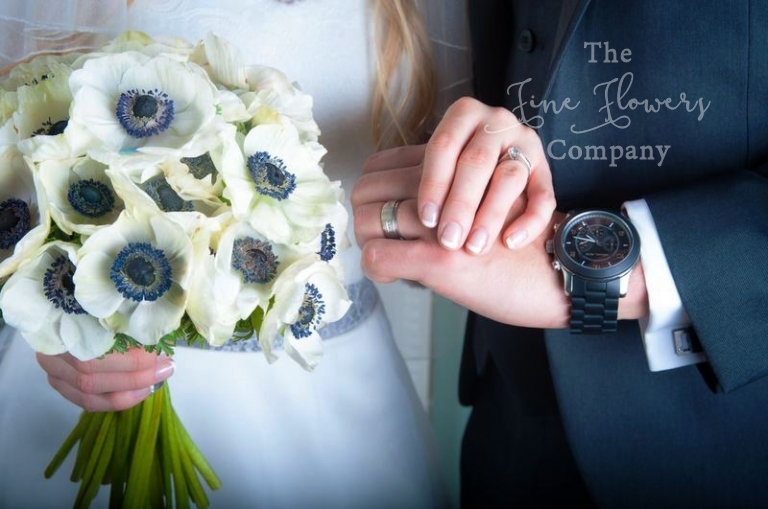 Its unusual bold black & white colour scheme was combined with soft and pretty vintage blush rose blooms and this unusual combination looked really lovely. Beth is such a sweet and happy bride, that even the gloomy weather failed to darken her joy. When we arrived at Botleys, the sky had literraly just openned, yet Beth and her lovely family were a pleasure to be around, really upbeat and relaxed, just like the wedding itself. Beth really liked the dreaminess of white gypsophilla and wanted it peppered with accents of blush pink and black. 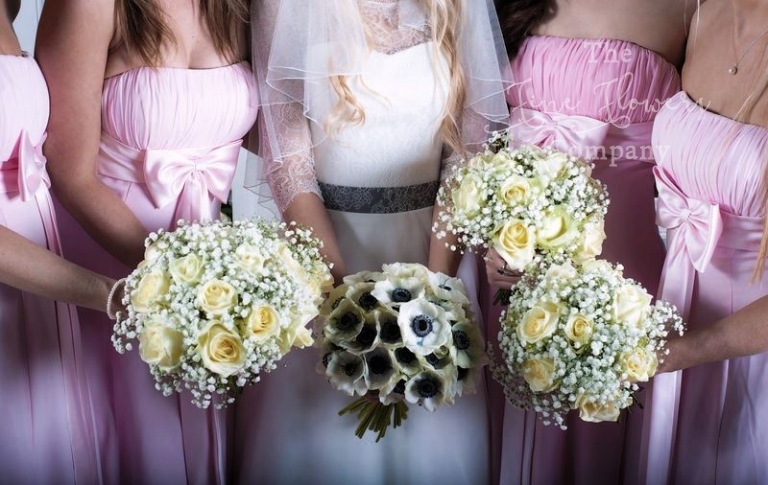 The bridal bouquet used white and black anemones which looked beautiful against Beth’s vintage dress. The four bridesmaids carried dreamy bouquets of gypsophilla and ivory Avalanche roses, tied with slate gray ribbon which looked fab against their floaty blush pink chiffon dresses. The mens buttonholes were all roses (James’ using ivory Avalanche rose, and the groomsmen’s using pale pink roses) with pretty gypsophilla accents. For these Botleys Mansion wedding flowers, we welcomed guests to Botleys with flower and ribbon rings dressing the two lamps framing the entrance steps. In the foyer, we created a pretty spring urn display of cherry blossom, which was surrounded by guests welcome cards and a very cute picture of the lucky couple as little kids – really sweet! The ceremony room was dressed with 2 dramatic flower displays in Martini vases, sitting on ivory plinths to match the decor of the room, filled with clouds of dainty gypsophilla studded with gerberas and ivory and pale pink roses. On the registrar’s table, 2 pretty vases were placed at either end of the ceremony table, connected by romantic rose petal scatter. The aisle too was lined in fresh roses petal scatter for a really soft and dreamy look. After the ceremony, leading down into the Botleys Mansion bright and airy Atrium, we lined the stairs with sweet posies of gypsophilla and roses, tied to the ballustrade with pretty long flowy ribbons all teh way to the floor, for an opulent look. The table centrepieces used tall Martini vase floral displays like the ones in the ceremony room, and a few of the guest tables used matching low vase centrepieces. All kept light and airy and modern, with cloud-like displays of gypsophilla, roses and white with black centres gerberas. Enjoy the lovely photos below, some of which ar courtesy of Sarah Olivier Photography.